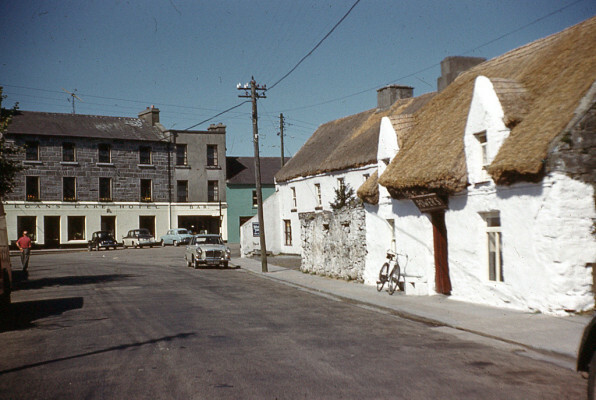 In the summer of 1961, the Parker family from Harlesden in London toured Ireland in their car. Mr John Parker was a greengrocer and many of his customers were Irish migrants from the west of Ireland. These customers suggested many places in Kerry, Galway, Mayo, Sligo and Donegal which were well worth a visit. Fortunately for us, Mrs Parker had a keen interest in photography, so she recorded her Irish holiday on 61 photographs, marking each image with the location where it was taken. What makes this photograph collection very special is the fact that Mrs Parker used Kodak Colour film which was only just becoming available to amateur photographers in 1961. Last year, Gordon Parker, the son of Mr & Mrs Parker (deceased), was clearing out some of his parents’ old belongings when he came across the 1961 holiday snaps, developed as colour slides. Gordon has lovingly converted each image into a digital file, to preserve his memories for ever more. Gordon was only a teenager when he accompanied his parents on their round trip tour of Ireland. Among the collection, one photo was marked with the reference “Oughterard.” Older natives from the locality will be very familiar with the two buildings captured on a very tranquil day in the town centre. Click here to see more of the Parkers’ 1961 photo album. Congratulations to All concerned for adding this photo.